The economic success of your business depends on many factors. A crucial one is collaboration with a bank you can fully trust at all times. 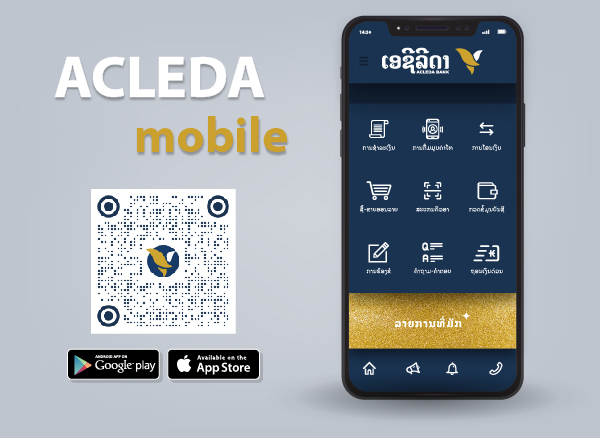 ACLEDA Bank Lao's experience and unique expertise can assist your growing businesses sail through the complexities they may face. Our aim is to support you in all financial areas with comprehensive and state-of-the-art solutions tailored to your company's individual needs. We offer innovative products and services designed to give you the critical advantage in all areas of your company. Whether you are expanding your business, buying your premises for office use or looking for a loan to fund working capital, we are happy to discuss your requirement and providing you with the amount of loan your business needs. Please click here if you wish to know how much you can afford to borrow, how much the payments will be, or how long it will take to pay off the loan. Please contact our branch for confirmation.